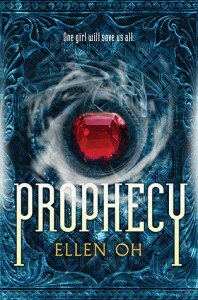 As soon as I read the summary for Prophecy by Ellen Oh, I knew I had to read it! I mean, a new fantasy series with demons and dragon kings and a kickass female warrior? Be still my heart! Sometimes books keep being compared to other much-loved books and this isn't always fair in my opinion. Because while Prophecy for me was a great start in what I have no doubt will be an epic series, going in expecting it to be the next Graceling is going to leave you a bit disappointed. Don't get me wrong, I really, really enjoyed it and think there's some amazing worldbuilding, but it doesn't rank in my all-time favourites, like Graceling does. But focusing on the story: Ellen Oh has created a world in which demons are a very real threat and Kira is the only one who can literally sniff them out. Which is pretty cool. Aside from the fact that pretty much EVERYONE in the kingdom is scared of her and because of that hating on her, it really showed what happens when people don't understand something. Angry mobs are really scary to me and Ellen Oh showed the power of just such a mob on more than one occasion. I liked Kira, though sometimes I would get so frustrated with her! I get that she doesn't really trust people, but she's also constantly shoving the ones who want to get to know her and be her friend away. I mean, to have someone like Kira guarding your book sounds like the perfect situation, but I don't know if I could be friends with her. I do admire how she puts the well-being of other before her own and I really liked her tiger spirit! I kinda loved that Ellen Oh didn't write a traditional fantasy which usually has a more European-like setting, I'm really loving the Asian influences and how it adds another dimension to the genre. I would have liked to see a bit more of a difference in culture between the seven kingdoms (and seriously I have to ask: why are there pretty much always SEVEN kingdoms/realms??? Is it somehow a significant number?? ), the customs seemed pretty similar to me. I mean, sure a lot of things are the same in Holland and Belgium, but we each have are own culture, so I expect this from kingdoms in fantasy novels as well. Ah the agony of an expected love triangle! Prophecy is the promising start of a new series that brings something to the genre I'd like to see more of! Though I got frustrated by the characters at times, the writing was engaging enough for me to keep turning pages. There are high stakes, loss, WATER DRAGONS (seriously, how cool is that?) and also friendship and a beautiful world to explore! I'm really looking forward to finding out what else Ellen Oh has in store for these characters!